a new sample, just some edited segments of a larger session pasted together. It's mainly a 4077 XNOR driven by 4 oscillators to make the snare-ish sounds and a melodygen later on in the tune. As always there is a lot more going on then I can possibly explain. Oh and yes, full springreverb on this one. Is that a home made spring reverb? Sounds like a thick spring! really wish it was, but just a preset in ableton live . It sounds great to my ears though and if it works, why not? It is sort of funny that they call it spring reverb because it sounds a lot like a spring reverb built with a slinky or other heavy spring. Not typical guitar amp style spring reverb. ah, I was wondering if it was close to a slinky reverb. I was planning on building one, but with my backlist growing every day and this one working very well I just might keep it like this. Im very much a "use what I have" kind of guy. 2 more adventures on the lunetta, now starring a 4052. A Tekno-ish track using just a 4052, a divider, VCO and 4 oscillators. little bit of spring reverb. A Looong noise track, just messing with high freq. oscillators and messing with clocks. tjookum, i've read you like the sound of your 555 vcos... and so do i! 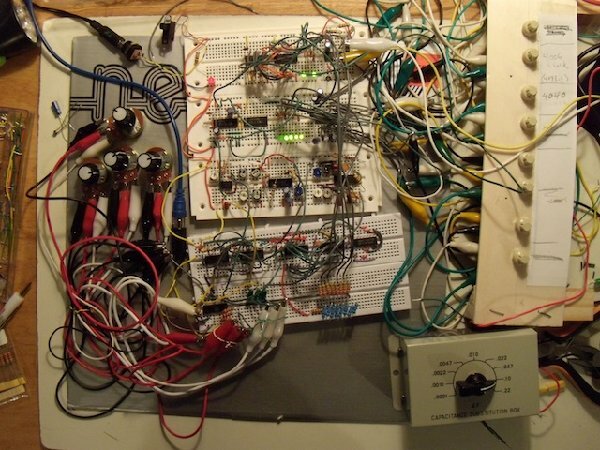 could you post your 555 vco schematic? I tried to build one up from the forrest mimm's book and got very little results with the lunetta voltages- the output sounded nearly exactly the same as the input. thanks in advanced! and...awesome tracks! It's actually 4x 556 oscillators/clocks Im very pleased about because they have a huge range and you can get into those ultra high freq. wich work very well with cmos. never build a 555 VCO, the single 4046 on my breadboard has worked so far. I'm putting together a 555 VCO at the moment, and it's not too bad. It sounds... just like a square wave should hahaha. HELLO electro-music People/Lunetta-ers! I've been lurking on these forums several months, learning lots of things... I've built a couple of boxes based on 555's and 4093's, and then fell in love with the Lunetta style. So now I am starting to mess around with more of the 40XX's, familiarizing myself with their workings whilst I decide if I want to go with a perfboard or panel design, and finding the right parts for it. 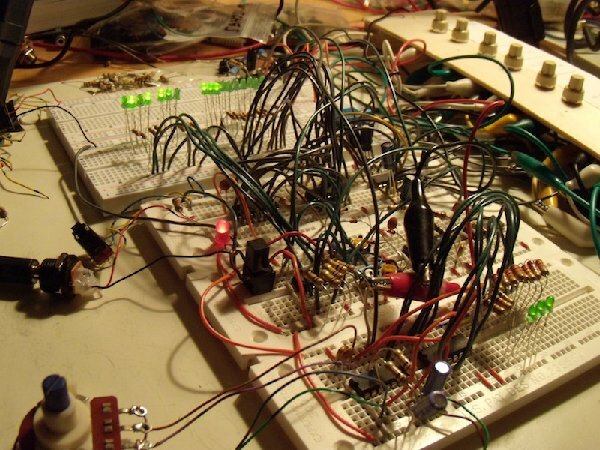 This is just a breadboarded "melody generator" with the 4017 & 4051 and driven by a 40106. Probably the trick of clocking the 4017's reset pin has been done, but I really like what it does. EDIT: NOTE: I made a mistake in the video's text! At around 1m02s, it's actually the Disable pin (13), not the Reset pin I meant. Wonderful stuff! Appreciate you posting - you are getting some great sounds. See how much better you feel after sharing it with us? Ofcourse it is! I really love seeing what people come up with and those first few bleeps are what got us all started in the first place. 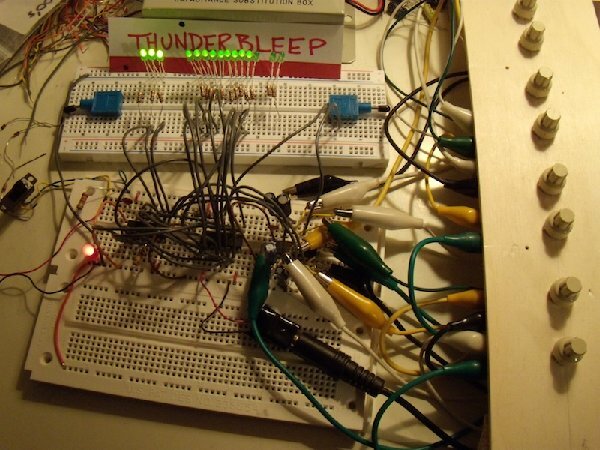 Really nice work on the breadboard, that is a great setup you have there with the pots and leds. Try out all kinds of different IC's and schematics, see what you like best and then decide how you are going to tackle your build. And thanks for the video, it's always a lot clearer to have visuals with the sound. And I've never seen someone put led's on all the 4017 outputs, that actually made it a lot clearer for me how it functions, thanks . As for my pot setup... i got tired of having them all over the place, so I quickly built that thing out of a side of a clementine box. But it's trouble in other ways... a mess of alligator clips that one has to be careful with so they don't touch and short. I'm still looking for a clean solution for breadboarding use. Last night I fried a 40106. Maybe it was my fault... it's pretty dry in my house, but I don't know... I've had a few problems with these... then I started using 4093's instead. And then 555's. But the 4093's are easier to gate on & off, which might be handy. Hmmm, OK, back to the work table...! Plus, to me, the lunettas are all about the blinking lights, so I just kept them in. I agree, leds are great when working with logic signals. They are Piher pt15 trimmer potentiometers with seperate plastic shaft. Cheap and they fit great on a breadboard. A jolt of static electricity can fry an IC, try not to work on carpet or use a electrostatic wristband. Interesting. Except that I tend to use a lot of pots and I don't have a lot of breadboard space. I was thinking of some kind of ribbon cable, but I can't find the right stuff in local stores. ALSO: I apologize... there's an error in my video!... I mention about switching on a clock for the Reset pin, but it was actually the Disable pin I meant. 1. 4029 up/down counter driving a 4046 PLL VCO, with possible resetting via 4040 outputs. I had a lot of trouble getting the 4029 to work. Was following drOffset's amazing sequencer diagrams, not sure what happened, but finally got it going, then almost burned it! 2. an arpeggiator thing, from the "fun with sea moss" site. 4 oscillators on a 40106 into a 4051 and a resistor ladder. hey tjookum those trim pots look ideal - do you have a part number for the plastic shaft? Great! thanks for posting these videos, I think you're doing great. It will really pay off in the long run to do a lot of testing on the breadboard so you don't end up with some useless modules on your shiny new machine. And good sounds so far. My suggestion would be to start messing with NAND, EXOR and NEXOR gates, they will make a huge difference to the sound. And although it is basically cheating a software reverb or delay can bring some nice variation to the squarewave sound. Here is the official datasheet of the pt-15 trimpot line from piher. And mouser is the only international online store I could find wich stocks them, I normally get them from a dutch supplier. My suggestion would be to start messing with NAND, EXOR and NEXOR gates, they will make a huge difference to the sound. But I also need to fix the mixer section, because when I turn one sound down all the way, it's still quite audible in the mix. Also noticed something strange... an oscillator on a 40106 affecting the sound of of my arpeggiator section, even when they are not connected (except by a common ground, I guess). Two recent videos. I'm still on the breadboards. However, in these videos, we don't actually see them. I modified an old CRT TV to respond to audio signals (I call it a fauxscilloscope, because it does not accurately display waveforms... e.g. a square wave isn't. but anyway, it looks cool to me). For approx the first minute of each video, I don't touch anything, then after, I start tweaking some clock speeds. WHEREIN: 4006+4077 random 4-bit generator feeds some inputs of an R/2R DAC which feeds a 555-based VCO, which is further mangled by a quad clocked 4066 which switches different caps in & out. WHEREIN: Same as above, but the DAC simultaneously feeds a triple-voice 40106-based VCO, so we hear both VCOs going. Most excellent ! I like the visuals too. Very lo fi-sci fi . I'm new to this forum and haven't posted anything cool yet, but I just wanted to let everyone here know that I'm really into this Lunetta thing right now. This site has been more than good help... it's been inspirational. Tjookum - Your patchable sequencer is just what I've been looking for. Awesome! I'll be sure to post some pictures of my Lunetta once I get some of the modules in the box. Thanks again everyone. here's a couple of things i have made recently. I've been making some simple things on stripboard for a while but I'm still wrapping my head around how to make things modular. This thread is really helpful, it's great to see people's videos with explanations about how things connect. going to add a rotary knob to this. and I'm also wondering if I could use the leds as gates, I guess they are all pretty slow apart from the main clock. I'm working on building a wearable lunetta, so that separate modules will be built into separate costumes and a few people play it together. 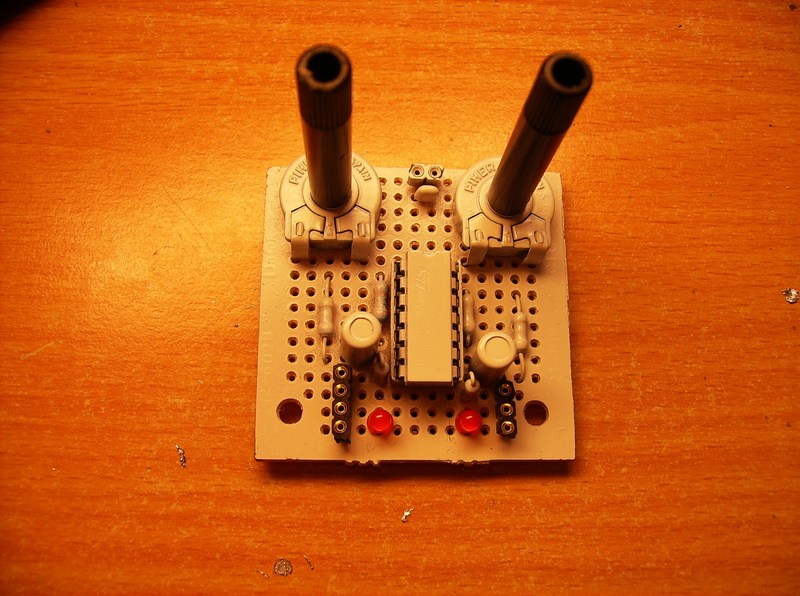 Here is 555 tone generator with a 567 ring modulator/noise maker built into a costume. I've knitted the potentiometer for the 567 - it changes restistance when stretched. There are soft buttons made with conductive fabric in the bottom scales of the mask. I think i'm going to start making something modular by building the slacker melody generator. If you have any suggestions for modules to build i'd love to hear them.